We recommend checking out our discussion threads on the iView Cyber PC Pro CYBER PC PRO, which address similar problems with connecting and setting up Desktop Computers iView. The user manual for the iView Cyber PC Pro CYBER PC PRO provides necessary instructions for the proper use of the product Computers & Solutions - Desktops & Workstations - Desktop Computers. The iView Cyber PC Pro is a Windows 10 Home system that will easily fit into your hand, pocket, or purse. 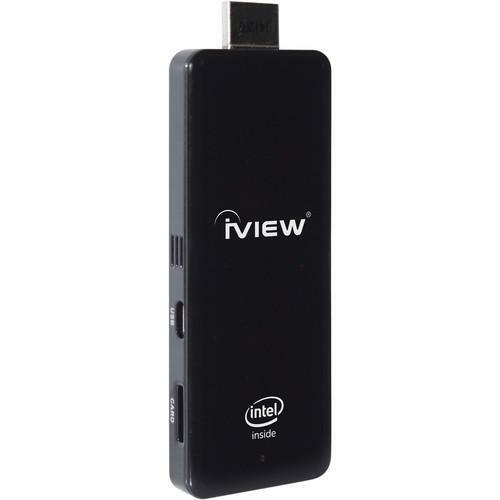 It features a 4.4" by 1.4" thumb drive form factor and connects to TVs, monitors, and projectors via an HDMI port. At the core, this system is powered by a 1.33 GHz Intel Atom Z3735F Bay Trail Quad-Core processor that can achieve speeds of up to 1.83 GHz. This Intel processor also comes with integrated HD graphics to deliver hi-res images and videos. Aside from the CPU, the Cyber PC Pro has 2GB of 1333 MHz DDR3 RAM and 32GB of internal storage. You may expand the storage capacity with an optional 32GB microSD card inserted into the built-in card slot. This amount of additional storage will provide ample room to store important files, documents, downloads, HD movies, games, apps, and more. This Cyber PC Pro comes packed with integrated 802.11b/g/n Wi-Fi and Bluetooth 4.0 for wireless connections to networks and speakers. There are also a USB port and two micro-USB ports. The USB 2.0 port will let you access printers, scanners, and other USB-compatible peripherals. While one of the micro-USB ports is used to power this device using the included power adapter, the other micro-USB port is available for syncing content from smartphones and tablets. Included along with the iView Cyber PC are a USB OTG cable, an HDMI cable, and a wireless full-sized keyboard with mouse cursor controls. If you own a iView desktop computers and have a user manual in electronic form, you can upload it to this website using the link on the right side of the screen. Box Dimensions (LxWxH) 18.1 x 6.7 x 1.9"
The user manual for the iView Cyber PC Pro CYBER PC PRO can be downloaded in .pdf format if it did not come with your new desktop computers, although the seller is required to supply one. It is also quite common that customers throw out the user manual with the box, or put the CD away somewhere and then can’t find it. That’s why we and other iView users keep a unique electronic library for iView desktop computerss, where you can use our link to download the user manual for the iView Cyber PC Pro CYBER PC PRO. The user manual lists all of the functions of the iView Cyber PC Pro CYBER PC PRO, all the basic and advanced features and tells you how to use the desktop computers. The manual also provides troubleshooting for common problems. Even greater detail is provided by the service manual, which is not typically shipped with the product, but which can often be downloaded from iView service. If you want to help expand our database, you can upload a link to this website to download a user manual or service manual, ideally in .pdf format. These pages are created by you – users of the iView Cyber PC Pro CYBER PC PRO. User manuals are also available on the iView website under Computers & Solutions - Desktops & Workstations - Desktop Computers. Hello there world. Here to request a digital copy of this manual.